The six major incorporated communities of Cochise County are Benson, Bisbee, Douglas, Sierra Vista, Tombstone and Willcox. Each has a unique history and character and each provides a gateway to a wide array of events, activities and historic and natural attractions. The communities also offer restaurants, lodging, services and shopping facilities. Other communities of Cochise County include Elfrida, Pearce/Sunsitesand Huachuca City. North of Cochise County, Graham County offers recreational opportunities at Roper Lake State Park and in the Pinaleno and Galiuro Mountains of the Coronado National Forest. 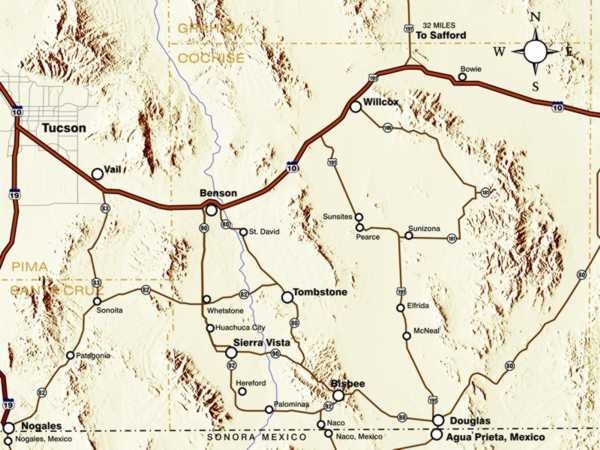 It is only about fifty miles from Willcox to Safford, the major city of Graham County. To the west, the smallest county in the state, Santa Cruz, is a quiet enclave with a decidedly Spanish flair. Sonoita, Patagonia and Tubac are full of history. Tubac, once the site of a Spanish presidio, is now a State Historical Park and nearby Tumacacori mission is now a National Historic Park. We hope to incorporate material on these attractions, as well as additional ones in Graham County, in the near future. The map below shows the major towns of southeast Arizona.